Solution: Rate-determining steps in traffic flow on a toll road.For which of the two scenarios in the figure will one get from point 1 to point 3 most rapidly? 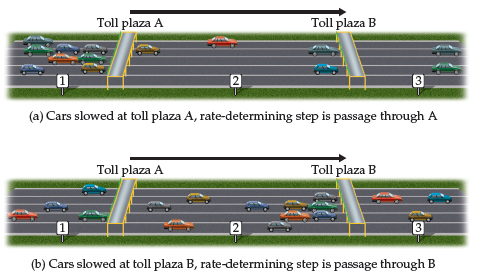 Rate-determining steps in traffic flow on a toll road. For which of the two scenarios in the figure will one get from point 1 to point 3 most rapidly? Label the energy diagram for a two-step reaction. Label the energy diagram (7 bins).